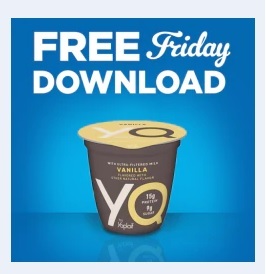 Free YQ by Yoplait Yogurt with Ultra-Filtered Milk (5.3 oz., select varieties) in Kroger stores, with coupon. This Kroger Free Friday Coupon is available for download on Friday, September 28, 2018 but you have until October 14, 2018 to redeem it. What is YQ by Yoplait Yogurt with Ultra-Filtered Milk? YQ by Yoplait is a snack 99% lactose free and made with ultra-filtered milk, packed with protein and has 40% less sugar than the leading Greek Lowfat yogurt. If you have question or concerns about your Kroger store - call 1-800-576-4377. Most stores offer catering services, bakery products like cakes, and breads or a deli that serves sandwiches and chicken wings. Ingredients: Pasteurized Grade A Ultra-Filtered Milk, Cane Sugar, Pectin, Sea Salt, Natural Flavor, Vanilla Beans, Yogurt Cultures (L. bulgaricus, S. thermophilus). Download the digital coupon for the product between 12am-11:59pm PT. You can view your coupon under the “My Coupons” section of your digital account or the Mobile App. Redeem your coupon in-store within 2 weeks for free YQ by Yoplait Yogurt with Ultra-Filtered Milk (5.3 oz., select varieties). Your coupon will automatically be applied at checkout when you use your Shopper’s Card. Available in most stores. KrogerAddict.com is not owned, operated, or maintained by the Kroger Co.